Situated across from San Diego Bay in California, Coronado has an idyllic year-round climate, picture-perfect postcard settings, plus the number one beach in America—you can’t go wrong here. Coronado is rich in history, and I had the pleasure of staying in one of the most historical buildings around: the Hotel del Coronado. 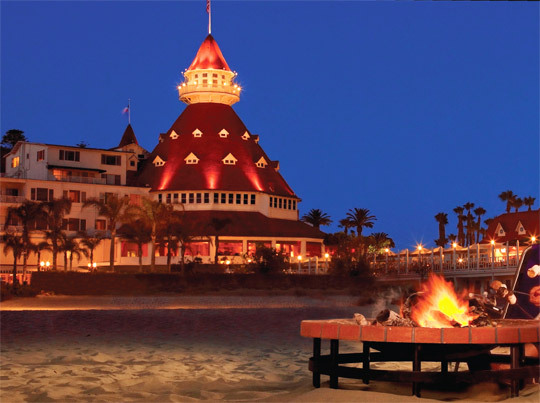 Located off the 1.5 mile long (about 2.4 kilometres) stretch of Coronado Beach, the Hotel Del (as locals call it) just finished celebrating its 125th anniversary. It opened in 1888 and has been making history ever since, from its incredible construction, to iconic red turrets, to legendary guests like Marilyn Monroe, Brad Pitt, Barbra Streisand and Oprah Winfrey—just to name a few. Shops on the Del is a unique San Diego shopping destination located at the Hotel Del and it offers a wide variety of stores ranging from apparel and jewelry to authentic historical items. The Spreckels Sweets & Treats shop is my personal favourite because it offers old-fashioned candy and gourmet chocolates—you’re on vacation, right? Guests can also play in the large outdoor swimming pool, pamper themselves in the award-winning spa, indulge at their award-winning restaurants (like ENO Pizzeria& Wine Bar; their Italian styled pizza provides a light dinner that’s still delicious) and participate in recreational activities ranging from beach yoga to kayaking and surfing lessons. I got to eat s’mores on the beach when the sun went down one night. A warm fire, the sound of the waves hitting the beach, surrounded by family and friends and as many chocolate treats as you can eat— who wouldn’t love that? Making smores at the beach campfire outside the stunning Hotel Del Coronado. One of the best ways to enjoy the outdoors is to take a scenic, 18 kilometre bike ride along the Bayshore Bikeway path, which is located off of San Diego Bay. My recommendation would be to rent a surrey bike that holds more than two people so that you can take your time while pedalling down the path, listening to the on-street live music and taking pictures of the famous San Diego Bridge, the Coronado Ferry Landing and the Tidelands Park. While we were on our bike tour, we saw a wedding and a quinceanera party taking pictures off the path and several locals and families enjoying the scenery. At that moment, I had the desire to pack up my things, leave Toronto and its cold, city weather and move to Coronado to enjoy the beach life. Since it’s surrounded by water, Coronado is the perfect kayaking destination. 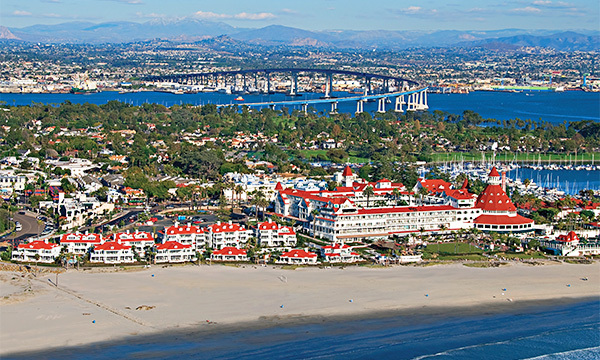 There are many places that offer lessons, like the Lowes Coronado Bay Resort. We embarked on a kayaking tour of the Silver Strand State Beach, guided by an educator from that beach. The idea of kayaking made me very nervous because I can’t swim (and I have a thing against dying while on vacation), but it was a great experience. I felt safe while wearing my lifejacket and with the State educator close by. My arms got a great work out, I saw my first jellyfish and the beach looked even more beautiful when you’re in the middle of the water—so no regrets! The San Diego Bridge from the Bayshore Bikeway—so beautiful! Wondering how it got the nickname The Crown City? Coronado is Spanish for “the crowned one,” hence its nickname. You’re sure to get the royal treatment here. A great vacation destination is always coupled with scrumptious food and Coronado’s cuisine did not disappoint. Because of its location on a peninsula, you can already guess that the seafood was delightful (that means a lot coming from a picky, non-seafood eater). Your Coronado vacation bucket list must include breakfast at Clayton’s Coffee Shop. 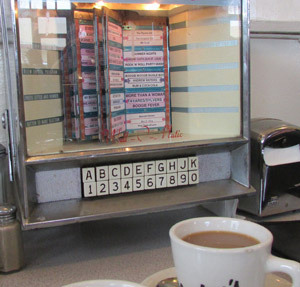 It’ll take you back to the 1950s with a traditional diner setting and tabletop jukeboxes. Plus, the food is great! I enjoyed the traditional bacon, egg and pancake breakfast, but the menu also offers vegetarian and gluten-free options, like omelets that can be made any way you like. Plus they had thick, homemade milkshakes—again, you are on vacation, right? If you’re a finger-licking BBQ kind of person, eating dinner at Lil’ Piggy’s Bar-B-Q will have your mouth watering with Memphis-style baby back ribs, pulled smoke pork, smoked chicken wings, sweet and smoky beans with corn fritters—the works! For dessert, Moo Time Creamery is a local favourite. You can create your own sundaes with their handcrafted ice cream or frozen yogurt and add a variety of toppings like candy, nuts and fresh fruit.